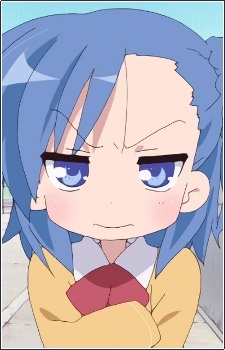 Age: 9 Birthday: September 6 Hikage is a short, temperamental girl and the youngest in the entire cast of Lucky Star. Hikage's appearance in the game has her with long light-purple hair; her hairstyle is distinctive, as she thinly braids her hair to the right, and uses that as a ribbon to tie her remaining hair. Her eyes are light blue and are slanted upward. Her appearance is a little different in the anime and manga, as she has short, blue hair instead of long, purple hair. Hikage or Hikage-chan, is the younger sister of Hinata Miyakawa . She is the youngest character in the Lucky Star series. Hikage attends the fourth grade at Sakura-en Public elementary school class 4-1. Hikage exhibits a classic Tsundere personality; and has a considerable dislike for the otaku culture and mannerisms because her sister, being a devout otaku herself, spends the majority of their income on manga, anime, and doujinshi. Because of her sister's mannerisms, Hikage wishes that she could grow up and be able to hold her own job to help support them and afford more expensive items. Often played upon is the fact that Hikage is often hungry because of the bare minimum foods the pair is able to afford, and is depicted as having dreams where she is able to eat meat. Hikage's first appearance in the anime is a brief background shot in Episode 12, then she appears alongside her sister in episode 16; after Kagami, Tsukasa, and Miyuki have purchased the comic magazine and Code Geass doujin from Hinata, Hikage comes up to the counter and announces that she is hungry. She is next seen in the 24th episode when they both show up at Ryōō High School to attend the culture festival, only to learn they came a day too early and they can't come in; this is very upsetting to Hikage, who chastises her sister for wasting money on the train ticket when they could have put it towards "hamburger steak or something fancy." Hikage also appears alongside her sister in episode 87 (Moe Drill) of the Manga, where she accidentally throws away some of Hinata's manga volumes, discovers her sister watching late-night anime, and learns the value of some of the other volumes that they possess. One of her fears is getting in trouble with her sister and being forced to "...go vegetarian for a week...", a fear which has been revealed to be an actual method used by Hinata to punish Hikage.